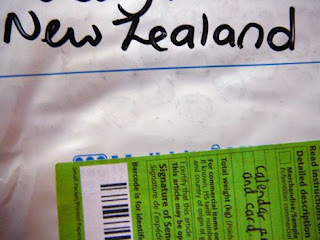 I was so excited today when I went out to get the mail and found a package from New Zealand! 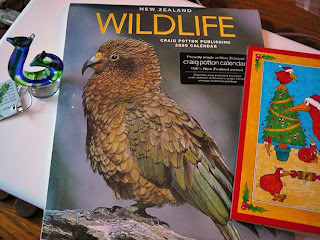 My Secret Santa, Maree (Just Add Books), was my Secret Santa and sent me a lovely calendar of New Zealand wildlife, and a beautiful little glass sculpture called “Fish Hook” or “Het Matau,” which “represents strength and determination and brings peace and prosperity and good health. Also provides safe journey over water.” They are lovely! Thanks for the gifts, Maree! And best wishes to you and your family for a very happy holiday in New Zealand! And a special thanks to Nymeth for organizing this Christmas Swap again this year! This entry was posted in Book friends on December 15, 2008 by Robin. What an awesome gift! I love stuff from other cultures/countries and that seems like quite the cool calendar. And that fish hook is incredible! Love it! Lovely blog, I to am an avid reader, mostly non-fiction these days with history and horticulture being 2 of my passions, bee keeping also. POp into my blogs if you get a moment, I live in an amazing country here in the South Pacific ! Thanks, Chris! Me, too…I love to learn about other cultures. The calendar will be lovely all year! It’s so nice to meet you, Ngaio! I will enjoy spending time at your blogs (took a quick peek this morning!). I love your name, by the way…I’m a huge Ngaio Marsh fan! What kind of flowers are in your avatar? They’re beautiful! You’ve just been tagged for Some Christmas Fun! Thanks again, Nymeth, for organizing this Xmas Swap for the second year. It’s such a nice way to meet and get to know new blogging friends! Wendi, I’m glad the gifts arrived and that you like them! I was so excited to get your name. We will have to meet, since we are so close! Also, thanks for tagging me for the Christmas meme. I’ll work on it today and post it soon. Thanks again, Maree! 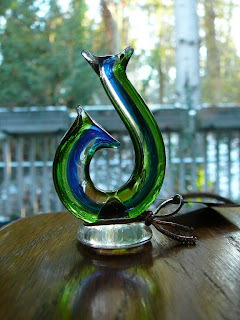 I love the little glass sculpture and I’m going to enjoy the calendar all year long. Bookfool, your parrot story made me laugh. They are so full of mischief! Bellezza, I love seeing what everyone has given each other, too. It’s such a nice tradition.